What is an embedded computer system? An embedded computer is generally a part of a larger system, where the computer itself is not the main purpose. It is designed to do a specific task, and is optimized to do so. The computer is programmable, but is not a general purpose computer like a PC, tablet or workstation. Typically a computer mouse, buttons, touchpad, keyboard, webcam, scanner etc. Select one that can supply appropiate voltage and enough current, but has the lowest quiescent current. Quiescent current is the current that the regulator uses. Intergrated circuits rely on a steady power source to maintain its preformance. By using a voltage regulator it is possible to remove a lot of ripple and noise from the source signal. Voltage regulators can be divided into two main categories: linear and switching. 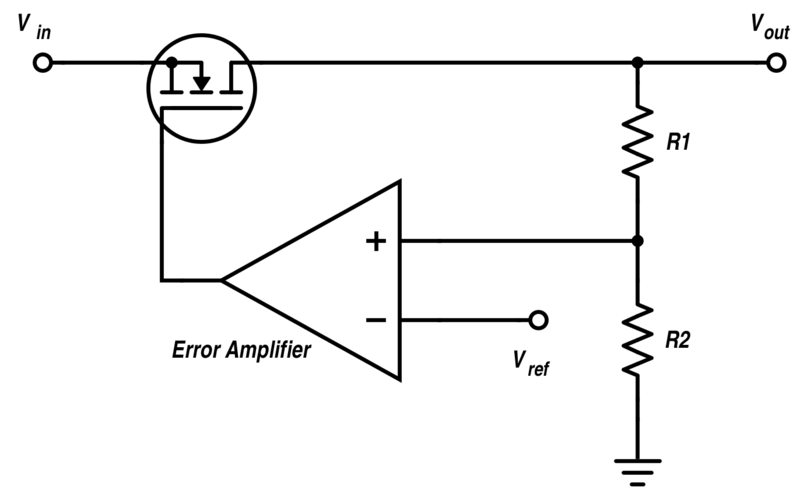 Low dropout regulator uses an amplifier and a transistor to regulate the voltage. When the output voltage differs from the desired reference the error is amplified, increasing the conductance of the transistor and increasing the voltage level on the output. Is a hybrid between standard and LDO regulator. Uses a transistor as a switch to connect and disconnect the input to an inductor. When the switch is on, the current passing through the inductor makes it store energy by inducing a magnetic field. The inductor opposes changes in current, so when the switch is opened, it then dumps its energy storage back into the circuit. A capacitor also contributes to smooth out the ripple produced by the switching. Buck-Boost regulator and charge pump the "Flying capacitor". Line: Securing constant output voltage, despite changes in input voltage. Load: Securing constant output voltage, despite changes in the supply's load. Many IC's are sensitive to changes in input voltage and may as a result behave strangely. Decoupling capacitors are placed in parallell and close to the voltage pin of the IC. High frequency noise that may be present on the line is "shorted" to ground with the capacitor acting as a shunt device. The capacitors should be places as close as possible to the IC, this is done to reduce the area between them, where noise may appear. It also acts as a source of immediate energy in case of a sudden drop in voltage. Ground is not always at the same electical potential at everywhere in the circuit. This voltage difference can cause large currents to be driven through the ground line. Decoupling is one way of minimizing the accurance of a ground loop. Coupling capacitors provides a coupling between devices that may have different voltage DC potential. By placing a capacitor in series an AC potential may be transfered across while the DC potential is stopped. This is often useful in instrumentation amplification. Continuously checking the device's status registers. It's also called busy waiting and wastes the processor's time, but is simpler to implement. Diverting the processor from normal program execution to handle an event, e.g. from a I/O device. This frees the processor from having to continuously checking I/O devices (polling). When an interrupt occurs, the processor saves it state by pushing its registers and program counter to the stack (or to shadow registers). An interrupt vector is then loaded, pointing to an interrupt service routine that is executed, ending with a Return from interrupt instruction, at which point the processor continues its normal operation. The interrupts are often prioritized according to how time critical they are. Polling interrupts: only one interrupt line, requiring the processor to check which peripheral the interrupt came from (requires a small number of peripherals). Vectored interrupts: several interrupt lines, one for each peripheral. Fast interrupt: Only saving the program counter during ISR, assuming the registers will be perserved. Useful when I/O devices require fast response from the processor. Wait state is pretty self-explanatory: When a computer tries to access external memory or another device that is slow to respond, it experiences a delay and has to wait. Each cycle during this time is called a wait state. This is a problem that emerged when the speed of processors startet to grow much faster than the memory technology was able to keep up with. It is common to reduce the clock speed during a wait state, in order to save power. We see that the CPI (Cycles per instruction) of this sequence is 5, but this may of course be reduced down to 1 by pipelining, and further reduced by adding additional execution units. We commonly see RISC processors with a CPI of 1-2. RISC processors are very energy efficient and are therefore very popular in mobile devices. The downside of RISC processors is that they require a lot of coding by the programmer. Precise code may however lead to less complicated electrical components, and we may say that the RISC processor is software oriented (at least more software oriented than CISC). CISC is looked upon as the "opposing" architecture to RISC. CISC processors have a small instruction set compared to RISC, but thier instuctions are able to do a lot more. They are very popular due to their simplicity: one does not have to "Hard-code" everything. Due to this they are very much used in personal computers and workstations, where power consumption is not that big of a concern. In many embedded applications the connections between external memory and the processor is pretty straightforward. In more advanced systems, though, we sometimes need to alter this connection and start managing it. When using space on the disc as virtual memory, it appears as if the processor has more physical memory than actually exist within the chips. Prevent certian programs from accessing specific sections of memory. In a system with multiple ongoing tasks, they shoud not be able to corrupt each others memory space. The logical (virtual) memory space of a computer is equal to the number of address lines. The physical memory is the actual memory attached to the computer. In some cases the physical memory is larger than the logical. It then becomes necessary to map the logical space of the processor into the physical memory space of the system. This is sometimes known as banked memory. This can be achieved by introducing a latch into the system. Architecture used in most modern computers. The steps taken are governed by sequential control of a program. Instructions and data share the same linear memory space. And there is actually no distinction between instructions and data, they are both stored as binary numbers. They only differ in the way the are used, as instructions are executed by the processor and data is manipulated. The data is also not separated by type, and could just as well be a character as a image pixel intensity. I/O devices using the same linear adress space as memory. The opposite is called ported I/O, and is less common. Group of signal lines having a related purpose. Most processors have a three-bus architecture. It points to an adress in memory on the adress bus. The data bus is used for reading and writing to memory. Finally, the control bus carries information to and from the processor about the state of the access; if it is a read or write, if there's an adress error or inputs to the processor like reset, interrupts, clock, etc. Processor points to an adress that it is trying to access, carried by the address bus. External circuitry determines in which device this memory location exists, and activates it. Performes an operation one or more operands, obtained from registers (or registers and memory locations). Control inputs decide the type of operation (addition, AND, XOR, left shift, ...) and status outputs provide special attributes about the operation, which can be used to control the program flow. Serial communication is a process where we send data one bit at a time as a sequence, over a computer channer or computer bus. This is a method used in contrast to parallel communication where data is transfered as whole bits, over a link with several lines. Serial communication is very popular due to it being a lot cheaper that the alternative. In asynchronous serial communication the data bits are sent over the line with no external clock pulse. This leads to that the recieving end needs to be able to interpret the data in some way. It has to lock onto the data transmission rate, and detect individual bits without the use of a sunchonizing clock. In synchronous serial communication an extra signal is used to help synchronize the two ends of communication. This signal is a clock pulse, and whenever the signal is high (or low) is tells the reciever that the data on the other line is ready to be read. The simplest form of serial interface. It coverts between parallel and serial signals, with some extra features. It uses a asynchronous transmission and reception of bit streams, meaning that (there's no clock and) correct interpretation of data at receiver depends on phase locking the receiver's clock and on pre-agreed communication parameters like bit rate, number of start bits, data bits, parity bits and stop bits. The UART also provides status information such as receiver data full and transmit buffer empty. Error checking is done by checking for the stop bit. If there is no appropriate stop sequence, the receiver assumes its clock has drifted out of phase, and a framing error is declared. It's up to the application software to check for such errors. An additional error detection method is checking the parity bit, which is calculated based on the data sent. This can be a simple odd or even bit, which tells uf the number of "1"s in the data is odd or even. This is very limited, and a cyclic redundancy check should be used instead. RS232 is an old and simple standard for serial communication, used for cable lengths up to 25 meters and data rates up to 38.4 kbps. Used for communicating between a computer and another computer, modem, sensor, etc. RS-232 is unbalanced - the voltage level of a data bit being tranmitted is referenced to local ground. An RS-232 link only consists of a driver and a comparator. Only one sender and one receiver per line. One side of the RS-232 link is the Data terminal equipment and the other is Data communication equipment, and connectors and cables are made accordingly. When implementing a RS-232C interface, all you need is a UART and a level shifter (usually a Maxim RS-232C interface chip) to give the required +12 V and - 12 V voltages. Whenever the transmitting system is much slower in preparing and sending data than the receiver is in processing it, handshaking is not needed. Otherwise, handshaking should be implemented using two signals; RTS (request to send) and CTS (clear to send). RTS is asserted by the transmitter when it whishes to send, and CTS is asserted by the receiver when its ready (the transmitter may send). Handshaking can also be implemented in software, as XON/XOFF. RS-232 is simple, but industrial systems require more robustness. Single ended doesn't cut it in a harsh environment, as ground can be contaminated. RS-422 serves as a robust alternative to RS-232. It employs balanced signals on a pair of conductors, a twisted pair. They are twisted to avoid being affected by magnetic fields (inductive noise) and to suppress cross-talk across lines. bit rate x cable length < $10^8$. To modes of operation: point-to-point and multidrop (1 sender, up to 10 receivers). Variation on RS-422 that is used for low-cost networks. Very popular, easy to implement. Competitor to CAN, but requires software for error handling etc. Defines the electrical interface in a multi-point network. Used extensively in industry as the physical layer of both proprietary and standardized networks (MODBUS,PROFIBUS). Drive diff. voltage: -1.5 V to -6 V and 1.5 to 6V. Rec. sensitivity: >= 200 mV. Common mode voltage -7 V to 12 V.
This interface is synchronous serial full duplex data link, using 4 lines in a master-slave configuration to allow a microcontroller to communicate with peripherals, like Flash, EEPROM, AD, DA, RTC, Display drivers, sensors etc. It serves much of the same purpose as I2C. Serial peripheral interface consist of a CLK (clock), MISO (master in, slave out) and MOSI (master out, slave in) wire and multiple SS(slave select) wires. 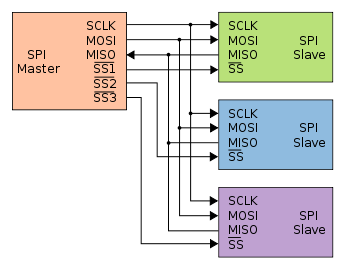 The CLK, MISO and MOSI are shared by all the nodes on the bus, but the SS is unique for each node. The master controls the CLK, MOSI and SS pins. Data is transmitted between nodes by exchanging bits in shift registers. In other words, if the master wants to receive data from a node it needs to transmit a dummy byte in exchange. It also means that the master can perform both a write and a read operation simultaneously, making SPI potentially a very efficient protocol. Some slaves (often those who only require singlebyte transfers) even support being daisy-chained together. Clock phase one: Opposite of clock phase zero. Also called two-wire interface because it consist of two conductors; SCL (serial clock) and SDA (serial data), both pulled to high when not in use. Unlike SPI the I2C interface is bidirectional and does not have several modes of operation. It is a multi-master bus, allowing deviced to act as transmitters, receivers or both. Controller Area Network is a bus standard developed by Bosch. It allowes for high speed transfers (<1Mbps) over long distances (<40m). It is also wery robust and therefore used alot in projects where conditions of operation may vary. The network consists of two wires terminated at both ends by $120 \Omega$ resistors. One wire contain a low voltage signal ($0V-2,5 V$) and the other a high voltage ($2,5V-5V$). 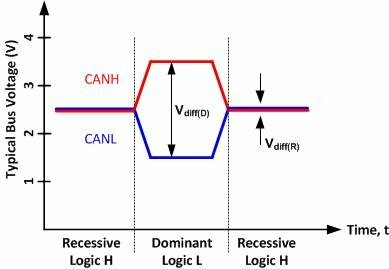 Logic highs and lows are determined by meassuring the voltage difference between the conductor pair. The CAN protocol allows for four different types of message frames. Overload frame: serves as a delay between the preceding or succeeding data or remote frame. Each data frame starts with an SOF-bit (start of frame), followed by the arbitration field consisting of an 11-bit iID + RTR-bit (Remote transmission request). The RTR-bit is what separates a data frame from a remote frame. The control field specifies the number of databytes to be sent in the succeeding data field (max 8 bytes). the CRC field (cyclic redundancy check) adds a unique number based on the remainder of a polynomial devision from the first part of the frame. The ACK (acknowlege field) is for the receiver to fill inn a "0" in the ACK-slot if the CRC checks out. The message frame is ended with an EOF-bit (end of frame). Arbitration works by granting the message with the lowest ID access to the bus. Message acceptance is decided based upon the whole identifyer of the arbitration field. Some CAN transceivers include mask registers for putting different messages into different receive registers based on ID. An error can occur from different sources. Lets just generalize them into receive and transmit errors. The CAN module handles errors by counting them in two counter registers. One for transmits and one for receives. Every time a valid error happens the corresponding counter is increased. After one of the counters reach 127 the module goes into a error passive state where the node can operate the bus as normal but it can no longer send error frames. If the node continues to receive and transmit with no errors the counter decreases. If a counter reaches 256 the node goes into a bus off state where it is not allowed to transmit on the bus. The node can return to normal operation by resetting the counters or by a special bus condition. Versa Module Europa bus is an asynchronous, multi-master standard that allows for transfer speeds of 40-80Mbps. Originally the data lines had a width of 16 bit, but was later expanded to 32 and then 64 bit. This device starts and controls the network. The coordinator stores information about the network, which includes acting as the Trust Center and being the repository for security keys. These devices extend network area coverage, dynamically route around obstacles, and provide backup routes in case of network congestion or device failure. They can connect to the coordinator and other routers, and also support child devices. These devices can transmit or receive a message, but cannot perform any routing operations. They must be connected to either the coordinator or a router, and do not support child devices. This type of ADC compares the input voltage to the comparison result and then updates the result depending on the comparison. A common way of SAR-logic is binary search. For example, the input voltage is 6.3 V and the initial range is 0 to 16 V. The input 6.3 V is compared to 8 V (midpoint of the 0–16). Comparison gives less than 8 V, so the range is updated to 0–8 V. Second step, the input voltage is compared to 4 V. The comparison gives more than 4 V, so the range is updated to 4–8 V. FThird step, the input voltage is compared with 6 V. Comparison gives greater than 6 volts, and search range becomes 6–8 V. The steps are continued until the desired resolution is reached. Devides a referance signal into a voltage ladder, then compares each voltage step with the input signal. The comparators outputs a logic high if tthe input signal is larger than the respective voltage step. 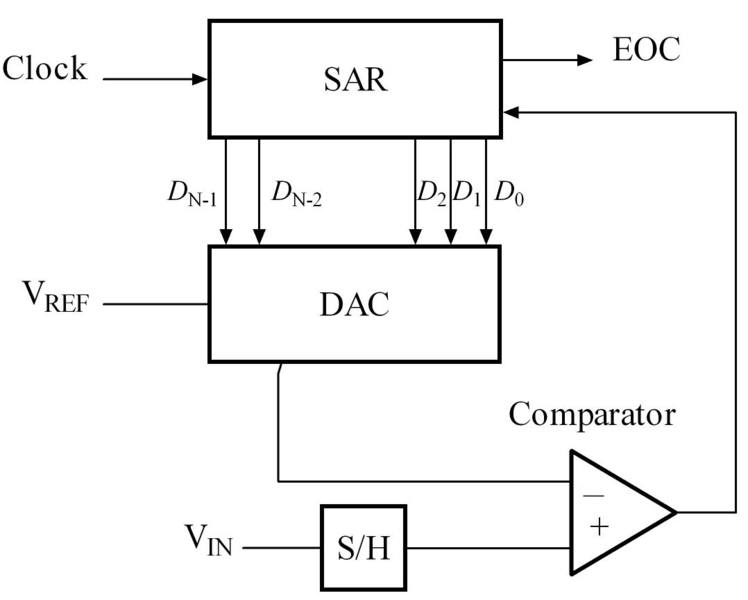 Unlike the SAR ADC, this does not need a track-and-hold device at the input because the comparators are the sampling devices. Depending on whitch ADC one uses, there may be som pretty big differences on the quality. Last updated: Sun, 2 Dec 2018 22:58:27 +0100 .